▼ 8 Collaboration Employees appear! 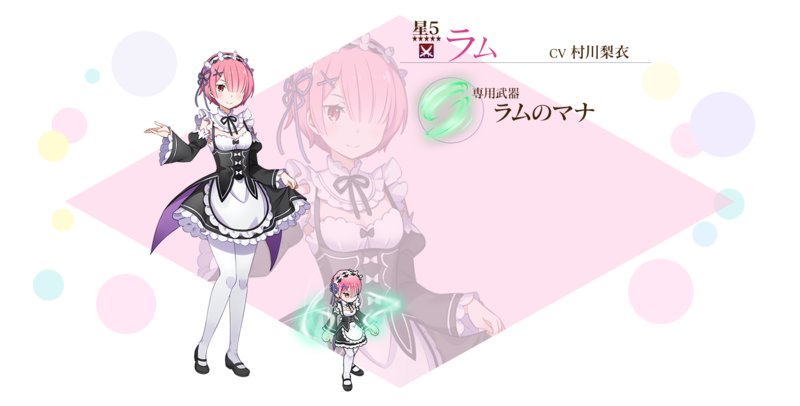 During this period, the Collaboration Employees [Emilia], [Rem], [Ram], [Crush], [Beatrice], [Felix], [Young Rem], and [Young Ram] from [Re:Zero - Starting Life in Another World] will appear! 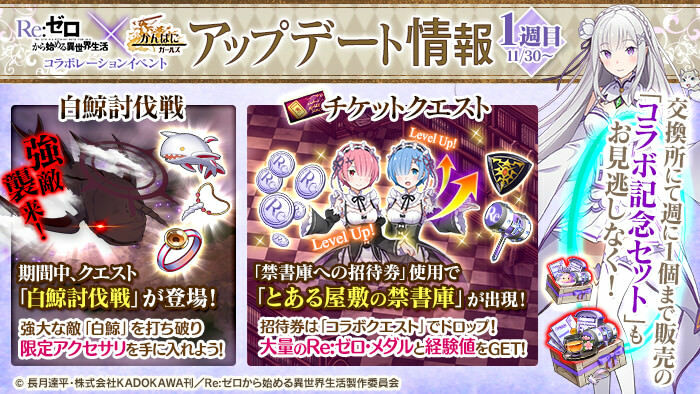 ※ [Young Rem] and [Young Ram] resumes are only available from special items and cannot be recruited from normal draws. 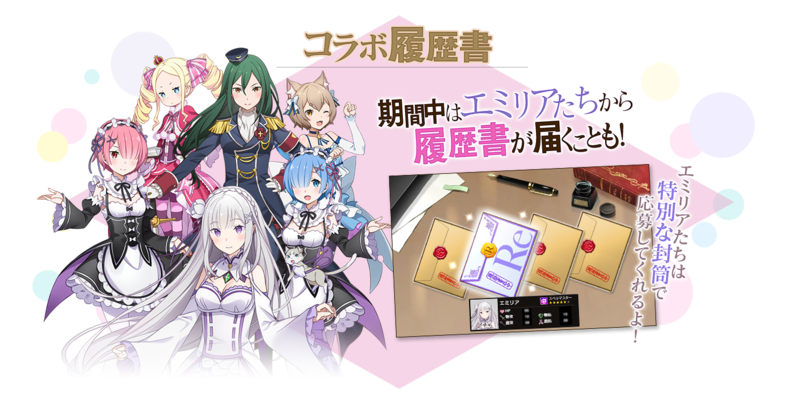 ※ The above employees will only appear during the [Re:Zero - Starting Life in Another World] collaboration event and will have increased resume rates. 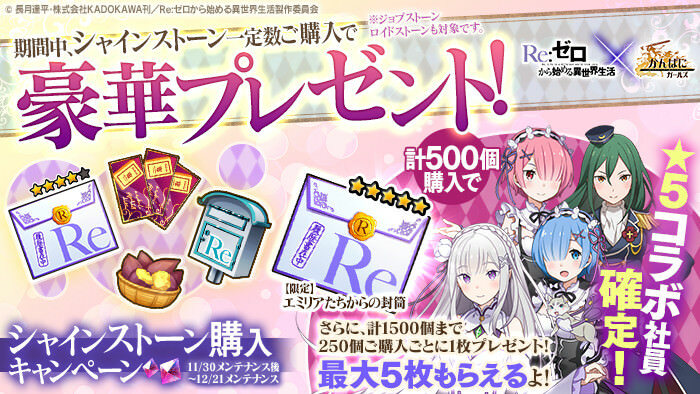 Furthermore, using the [Limited] Re:Zero Postbox will increase these chances. 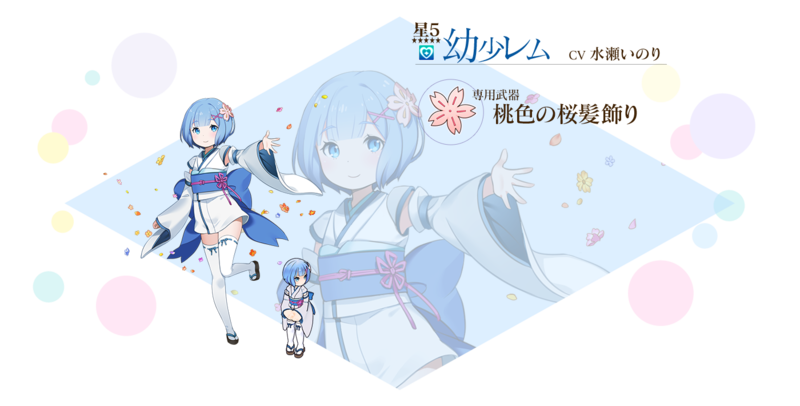 ※ Excluding [Young Rem] and [Young Ram], the above employees can be recruited from the rewards received from the [Collaboration Commemoration Shinestone Purchasing Campaign]. Read the story of how Emilia and her friends arrive in Misterio. 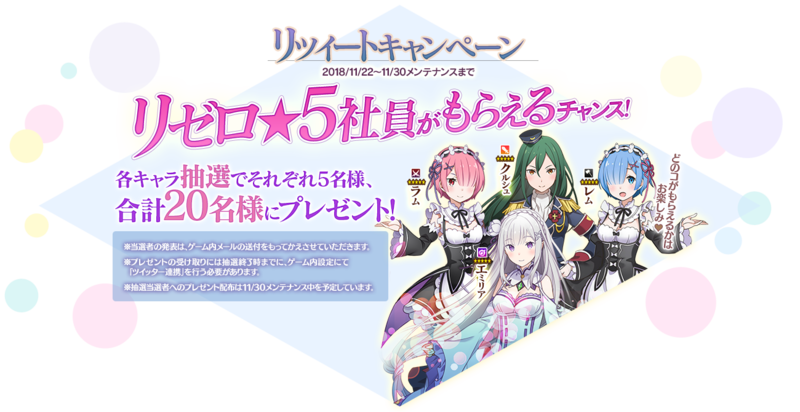 An event quest that rewards [Limited] Re:Zero Medals and EXP. There is a chance of getting [Limited] Forbidden Library Invitation Tickets as a rare drop. Use the [Limited] Forbidden Library Invitation Tickets to unlock this quest for 15 minutes. 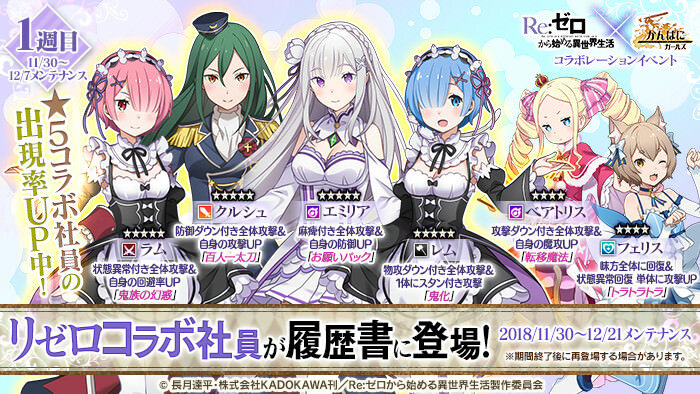 This quest drops lots of [Limited] Re:Zero Medals. 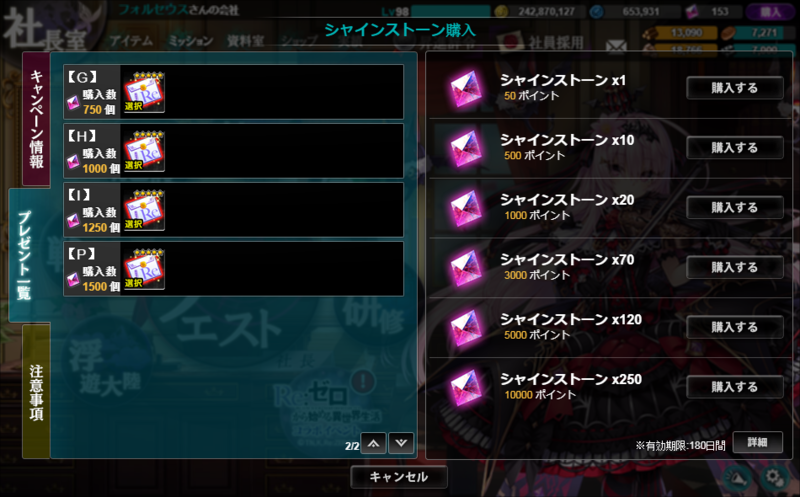 There is a chance of getting [Limited] Spirit's Garden Invitation Ticket and [Limited] Royal Selection Insignia as rare drops. Use the [Limited] Spirit's Garden Invitation Ticket to unlock this quest for 15 minutes. This quest drops recruitment items. 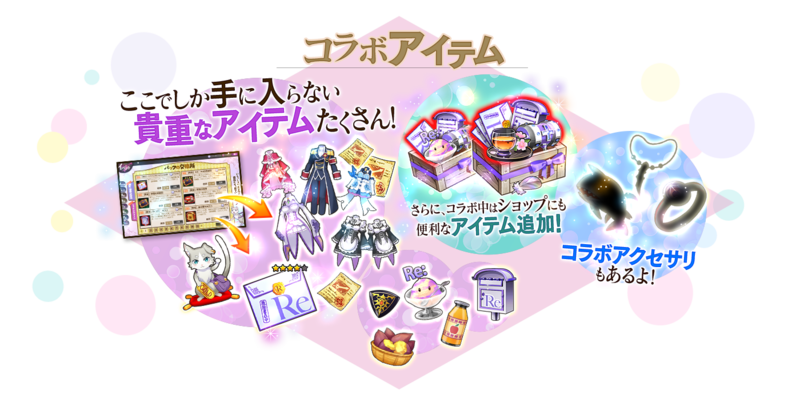 [Limited] Re:Zero Medals that you can obtain from the collaboration quests can be exchanged for items here. ▼ Limited Time Quest [A Certain Estate's Forbidden Library] appears! The collaboration quest can have a rare intruder that may drop the item [Limited] Forbidden Library Invitation Tickets which unlocks this special quest for a certain amount of time. 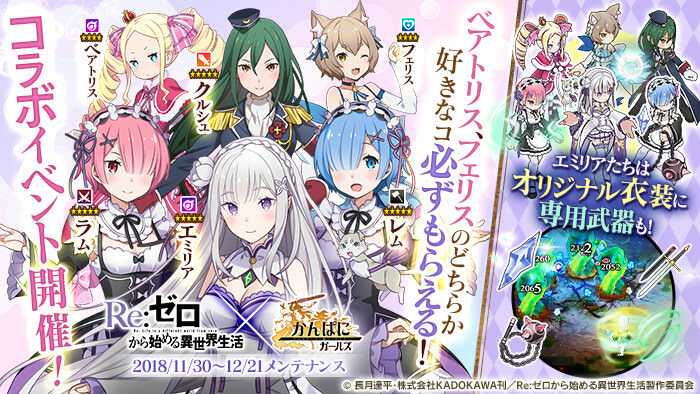 The [Limited] Forbidden Library Invitation Tickets unlocks [A Certain Estate's Forbidden Library] for 15 minutes, where you can obtain large amounts of [Limited] Re:Zero Medals and EXP, and the [Limited] Spirit's Garden Invitation Ticket appears as a rare drop. ▼ Limited Time Quest [Spirit's Garden] appears! The limited time quest [A Certain Estate's Forbidden Library] has a chance of dropping the [Limited] Spirit's Garden Invitation Ticket. 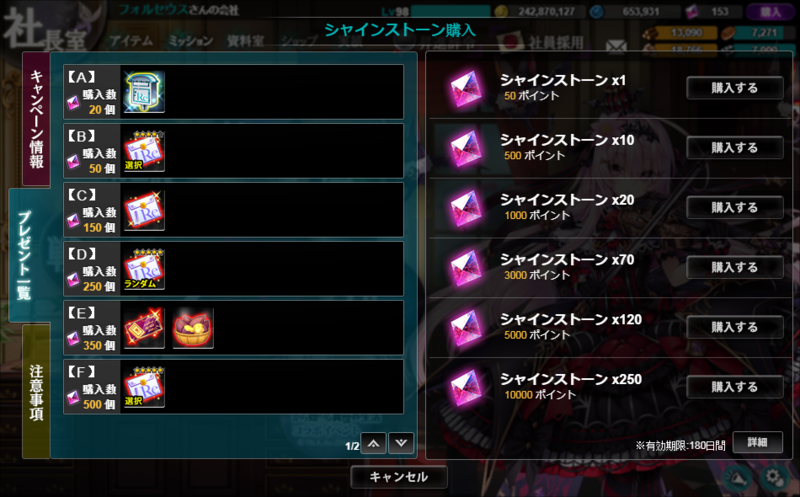 There is a chance of getting [Limited] Black Fairy's Envelope, [Limited] Fairy's Sweet Sake, and [Limited] Fairy's Envelope as rare drops. ▼ Powerful Enemy [White Whale Subjugation] appears! 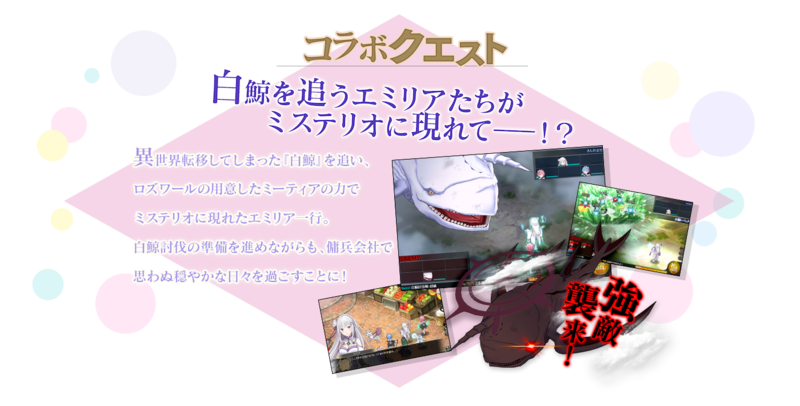 [White Whale Subjugation Quest] is a collaboration time limited battle against the powerful enemy [White Whale]. Each difficulty has a chance to drop the [White Whale] related collaboration accessories [White Whale's Necklace], [White Whale's Ring] and [White Whale Doll]. 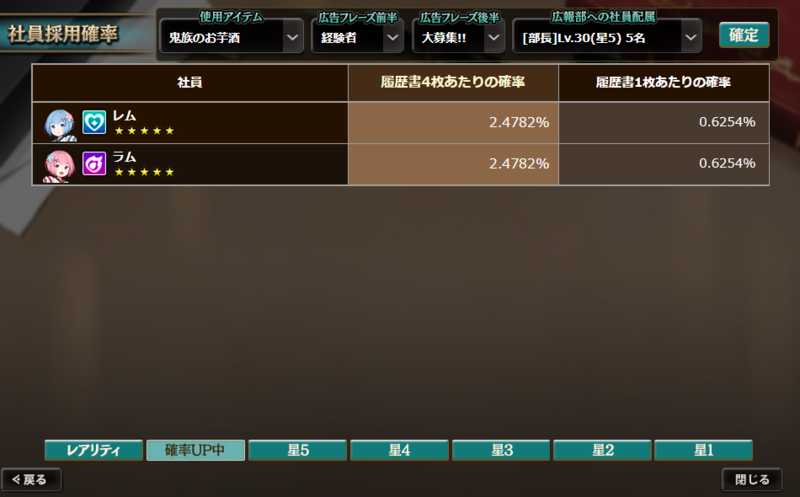 ※ Higher difficulty maps have increased drop rates for +3s. See the Event Tab in the [Mission] menu to confirm the details. Increases EXP gained when eaten. A seed that can recover magical power. Power wells up when eaten. A beckoning Puck statue that brings good fortune when set up. An indispensible good for companies looking to earn money. A fruit milk that grants even more fame. Uses abbles native to Lugunica. An insignia used for selecting the next ruler of the Kingdom of Lugunica by the dragon priestess. Gives off a light when held by those who are chosen. An invitation ticket used to go to A Certain Estate's Forbidden Library. Various kinds of books are kept here. An invitation ticket that opens the path to a garden where Spirits gather. 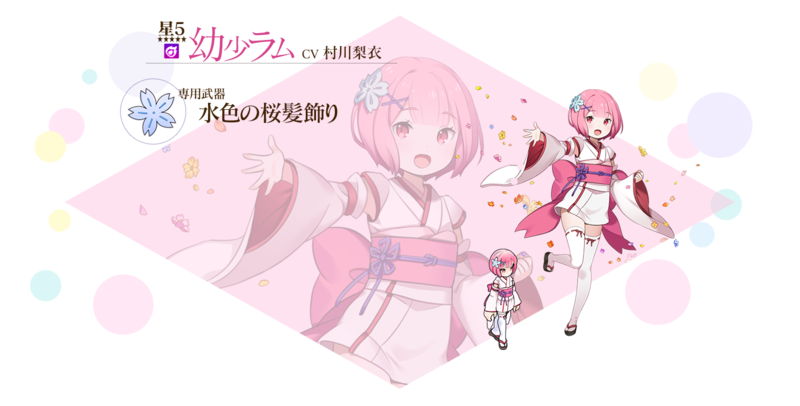 A Re:Zero collaboration potato based alcohol that brings fairies to good spirits, delivering envelopes. 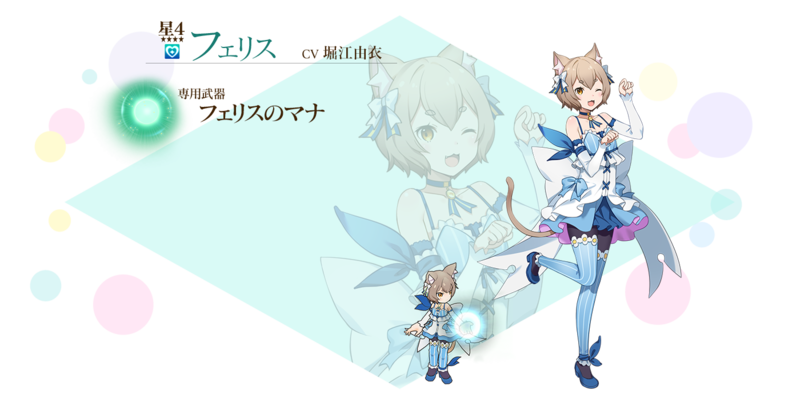 Increases the chance of Pluses appearing when manufacturing Re:Zero Collaboration Employee Exclusive Equipment for 15 minutes when used. 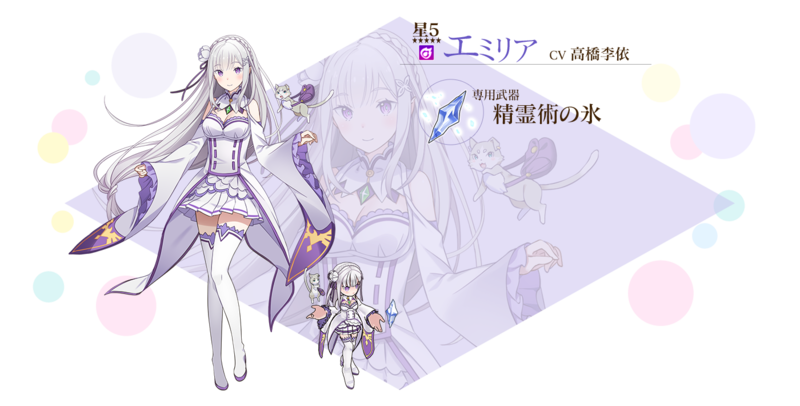 Greatly increases the chance of Pluses appearing when manufacturing Re:Zero Collaboration Employee Exclusive Equipment for 15 minutes when used. 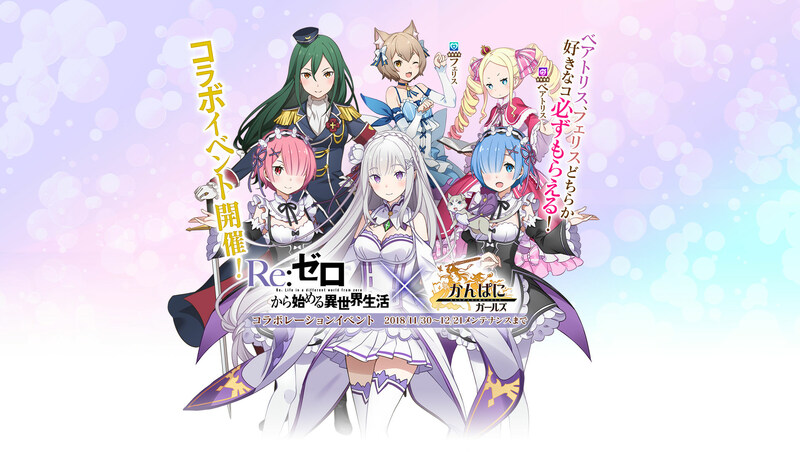 Increases the chance of resumes appearing from talented and Re:Zero Collaboration Employees for 15 minutes when used. 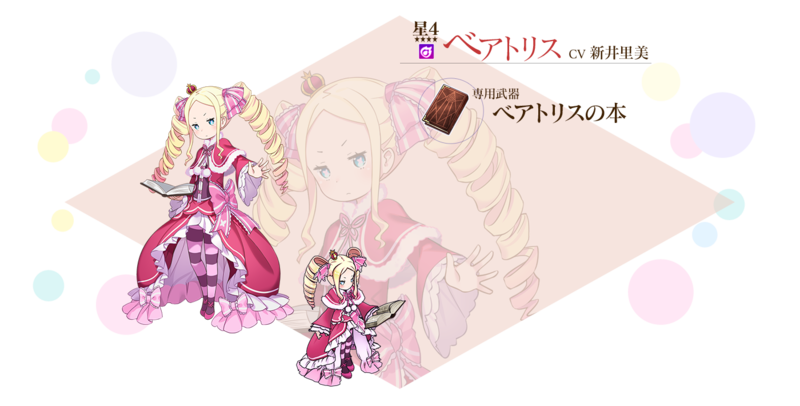 Greatly increases the chance of resumes appearing from talented and Re:Zero Collaboration Employees for 5 minutes when used. ※ Condition (2) will be added in Week 3 with the Voice Stone (3) for each collaboration employee. ※ The event will end with the 12/21 (Fri) maintenance. ※ [Limited] items with will expire with the 12/21 (Fri) maintenance. 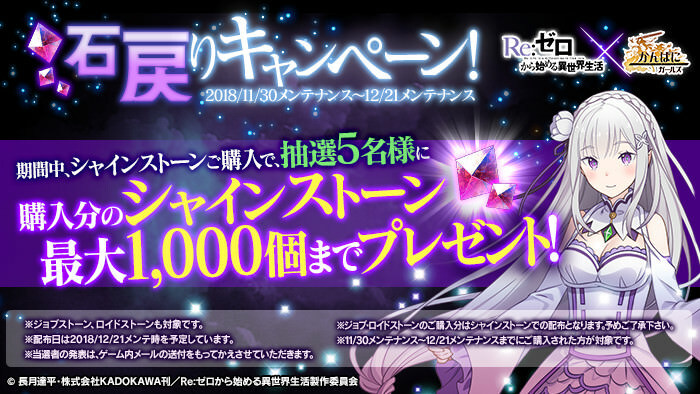 Five lucky winners who purchase Shinestones during the campaign will receive that amount up to 1000 Shinestones as a present! 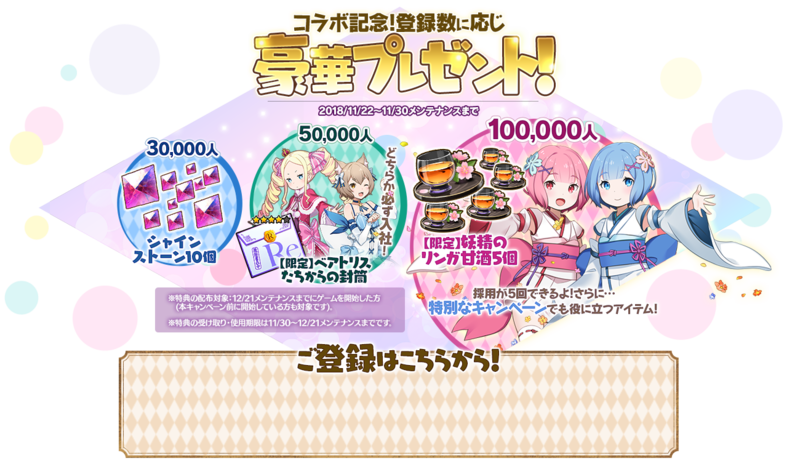 During the event, recruit employees using either [Shinestones] or [Limited] Fairy's Sweet Abble Sake and receive items as presents! ※ [Limited] Ogre's Potato Sake allows you to receive resumes one time without using Shinestones. 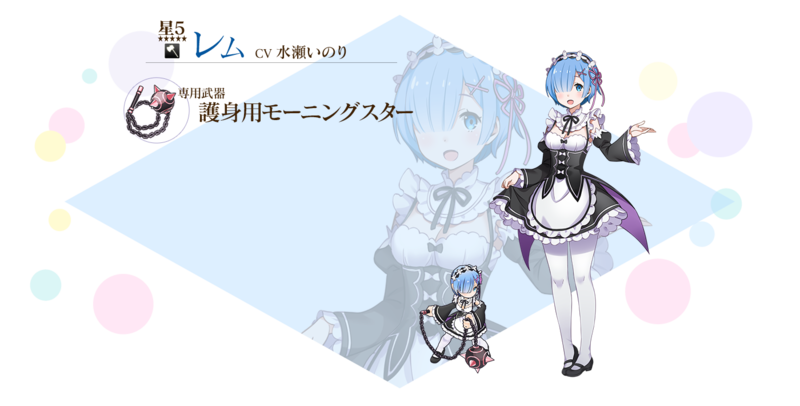 This item has a chance for Young Rem and Young Ram to appear. The other collaboration employees will not appear. Please see the game's [Employee Recruitment Rates] for more details. ※ [Limited] Young Ogre's Envelope (1x) randomly gives a resume from either Young Rem or Young Ram. 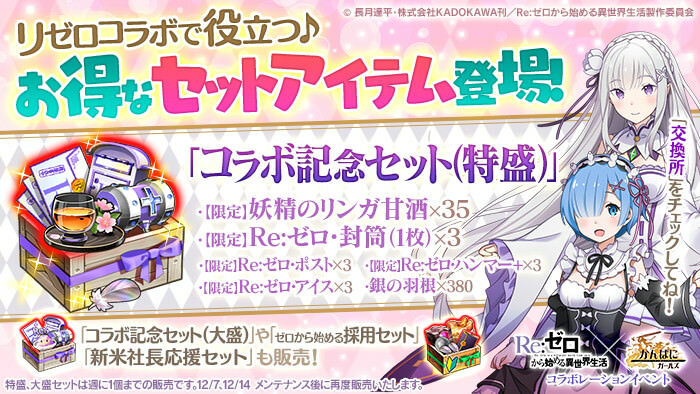 ※ [Limited] Young Ogre's Envelope lets you choose a resume from Young Rem or Young Ram. The teaser site will update every day at 00:00. 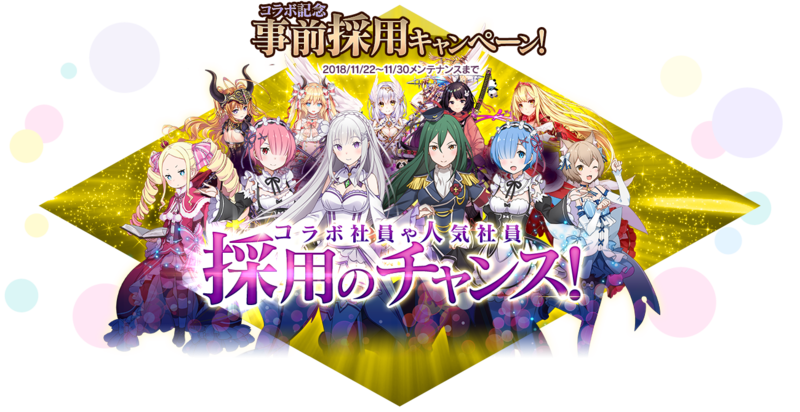 I assume the event will start on Nov 30 since the current campaigns don't end next week, while the site will countdown to the full reveal next week where they announce all the information. 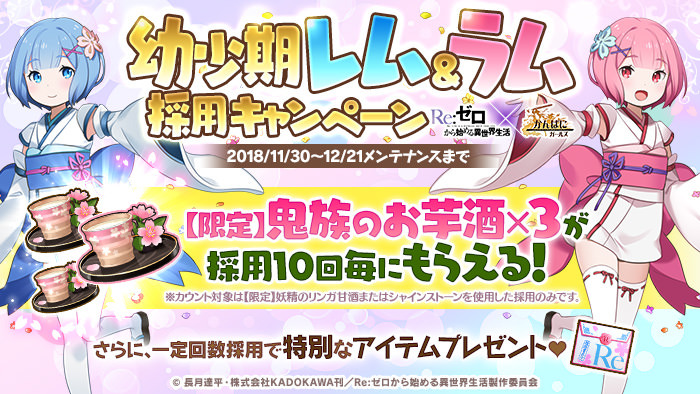 Looks like the event will begin on 11/22 (Thu)? Last edited by Folseus; 11-30-2018 at 09:30 AM. Day 2 added Beatrice to the silhouette. I doubt there will be 5 more characters for each remaining day of the countdown though, but who knows. wait. how many characters are there, the space is still too wide. are they going by the novels? 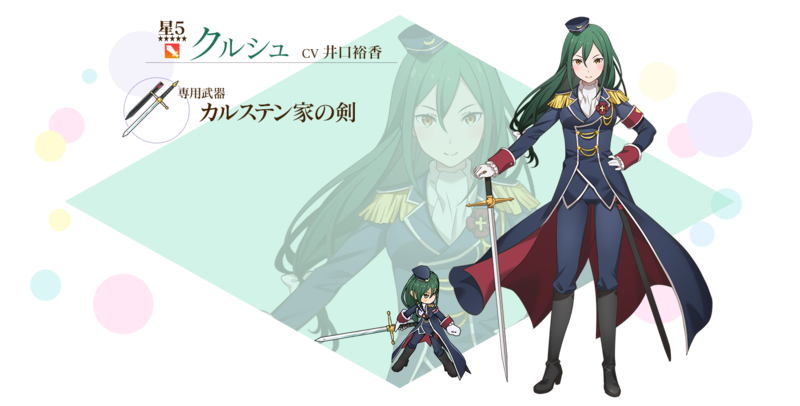 will shaula and echidna be there too? LMAO, dont tell me, that cat-trap is real?